Dianne L. Hyman, MSN, RN, OCN, CN-BN is a certified oncology nurse and the Transition Care Manager at MD Anderson Cancer Center at Cooper. 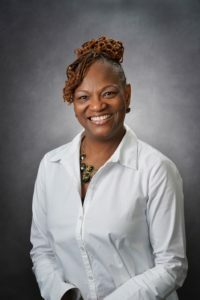 Born and raised in Camden, Dianne is a graduate of Woodrow Wilson High School and is the founder of “Sister Will You Help Me?” a breast cancer support group that welcomes women of color and faith to share their stories and encourage their peers through support and prayer. Q. Why did you decide to become a nurse? A. I have known since I was a little girl that I wanted to be a nurse. My mother dreamed of becoming a nurse, but raising seven children took priority. Though her dream was deferred, it became my dream, and I am proud to have made it a reality – for my mother and me. Q. What do you like about practicing at MD Anderson Cancer Center at Cooper? A. I love practicing here! I believe in our mission to serve, heal and to educate, and as a product of this great city of Camden, my heart for the underserved makes practicing at Cooper a win-win for me personally and professionally. A. The proceeds of Pink and Teal help so many of our patients, especially through the Patient In Need Fund. The Patient In Need Fund not only helps cover the cost of transportation, which can be a huge barrier to care for some patients, it also helps pay overdue utility bills, medications and various supplies as needed. A. I have an array of reading material on my nightstand. My Bible of course and books on spirituality are on top of the stack. One of my favorites is Priscilla Shiver’s “Discerning the Voice of God”. I also have books on leadership, including “Our Iceberg is Melting” by John Kotter and “Leaders Who Last” by Dave Kraft, and I can’t forget my adult coloring book. Q. What is your career theme song? A. “I’m Coming Out” by Diana Ross has been my personal theme song for years. Q. What is something people may not know about you? A. I was named homecoming queen and voted most popular and student with the sunniest smile during my senior year of high school at Woodrow Wilson in Camden. Q. What is your greatest professional achievement to date? A. Implementing the “Sister Will You Help Me?” cancer support group 17 years ago is my greatest professional achievement. It has been a ministry. The meetings are a place where hundreds of women of color and faith have come at various times throughout their journeys for support and to be able to be of service to so many is truly a blessing. I am grateful and humbled to be the founder and facilitator of this group. Q. What do you enjoy doing when you’re not working? A. I love spending quality time with my husband, David, and our son, who is also named David. They’re my guys. Our son is 20 years old and is involved in martial arts. Through his martial arts program, we have traveled to some amazing places around the world to watch him compete.